TL;DR: I used gource to visualize the ATLAS trigger code development activity in SVN as a way to illustrate the size and the collaborative development environment of the experiment. It’s hard to convey to a general audience the size and scope of particle physics experiments. Not just the sheer size of the detectors, but the small army of scientists who are all working together. The modern incarnation of particle physics is a highly collaborative effort. The ATLAS masthead, the list of all the authors who get credited on publications, is about three thousand names long and the list of active member, who are affiliated in some way, shape, or form with the experiment, has over fourty-seven hundred entries. This may be small on the scale of big companies (Microsoft has something like ninety thousand employees), but it is absolutely massive on the scale of academic research. A while ago I cam across gource (http://code.google.com/p/gource/), a tool for “software version control visualization” which renders project activity in many popular repository systems including SVN, which ATLAS uses. It’s rendered output does a good job of representing what I so frequently have trouble conveying about our field. As an example, I pulled the log files for the SVN used by the trigger group (which is one of the areas I’m most involved in), cleaned them up a bit, and passed them to gource. The output below shows the activity in early 2002 when the SVN was started, in 2009 right before collisions were first slated to begin at the LHC, and in late 2012 in the middle of the latest and highest intensity running of the LHC. I scrubbed the video of most identifying information (user names, directory names, etc…), but I think the point still comes across. 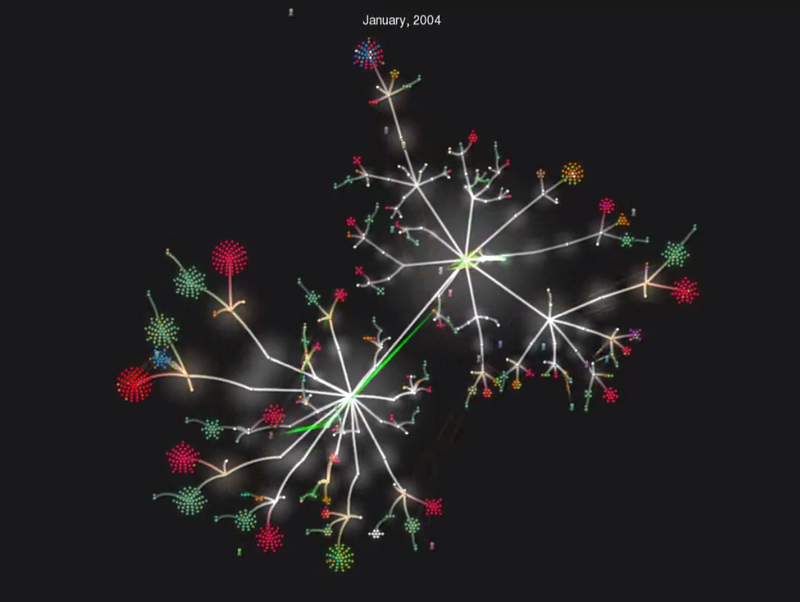 Each branch in the video represents a directory, the colored dots are files, and the little icons zooming around are users making commits to the SVN repository. Every time I watch this video I’m struck by how much cross-pollination is going on.